Caroline is currently working as a landscape architect at Sweco (www.sweco.co.uk). She is also a part-time tutor of landscape architecture at the University of Edinburgh and is working on publication of her research on the perception of scale and scale effects in the landscape with specific reference to wind turbines in Scotland. Caroline possesses detailed insight and understanding of the complex factors that create a landscape and influence how it may change over time through various design and management. Her work is innovative, methodical and thorough. 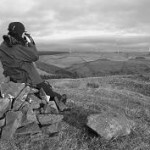 She has unparalleled experience of the landscape and visual impact assessment of windfarms across Scotland and communicates clearly using text and images, as well as through presentations (during which she always conveys her great enthusiasm for her subject). Caroline is a chartered member of the Landscape Institute, the governing body of Landscape Architects in the UK. She has worked across the UK, as well as carrying out research and giving presentations upon the European continent and in the US. She is based in the Scottish Highlands.